Are you a fan of color? This is something I've learned about myself through the years. I like to be surrounded by color. I know you've all seen that trend all over blog land where everything is white. White kitchens, white living rooms, white furniture. If there is any color it's gray or wood tone. It's actually been around a while. Back then they called it the "shabby" look which was more frilly and pink, but now it's called the "farmhouse" look which is more rustic. If that is your thing then hey, that's wonderful! It looks pretty in pictures and in Hobby Lobby but I don't like it so much in my own home. I've tried it before and I couldn't live with it. Maybe it's in my DNA, my culture, but I love to have it all around me. There's something so warm and cozy about rich tones. For the longest time my favorite color was red. But now the color I can't seem to get enough of is yellow. And it seems a lot of the things I've brought home lately reflect my current mood. Score! 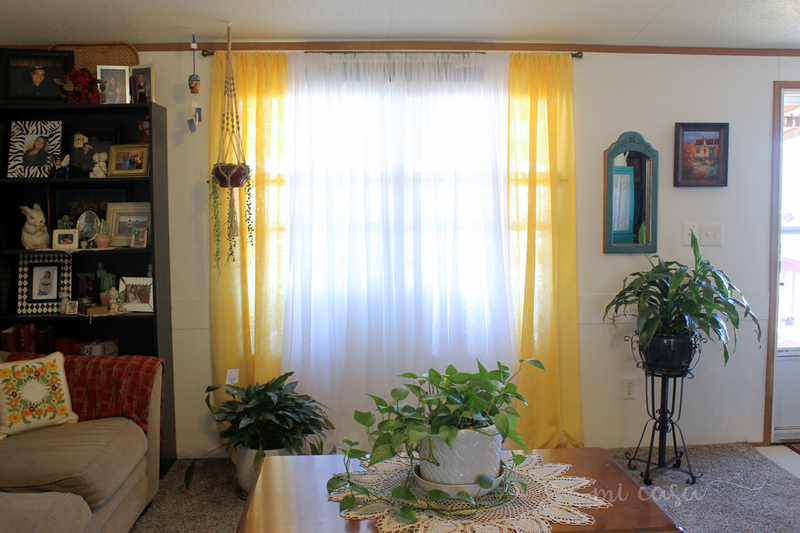 I've been wanting yellow curtains for the longest time. I ended up finding these last week at a big name outlet store. I love, love, love them. I can't stop looking at them. It's like a warm harvest, golden maize color. I was walking around in a department store the other day and heard over the intercom that the color for the season was mustard. I smiled to myself and said a silent Woohoo! I must be on the right track. Not that I'm ever trendy or try to be, but maybe for a short season I'll look like I have it together. Mr. A. thinks October is such good sleeping weather. 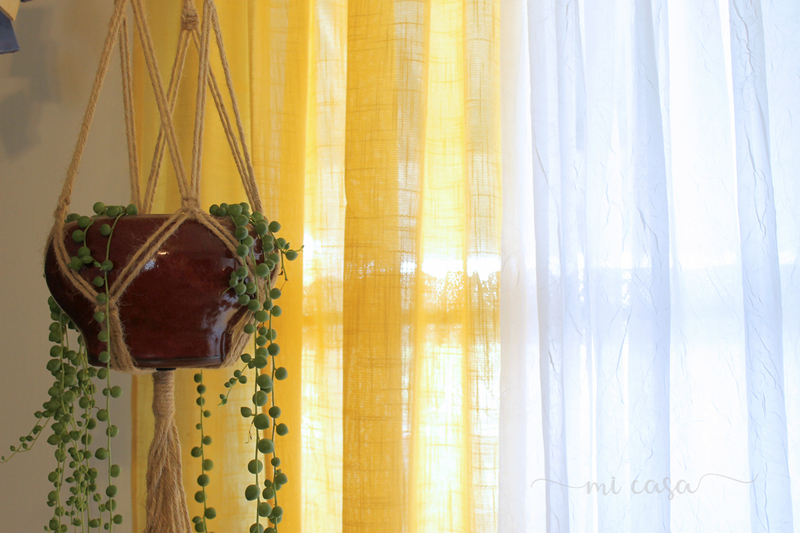 How pretty all that sunshiny yellow looks dancing in your lovely home. 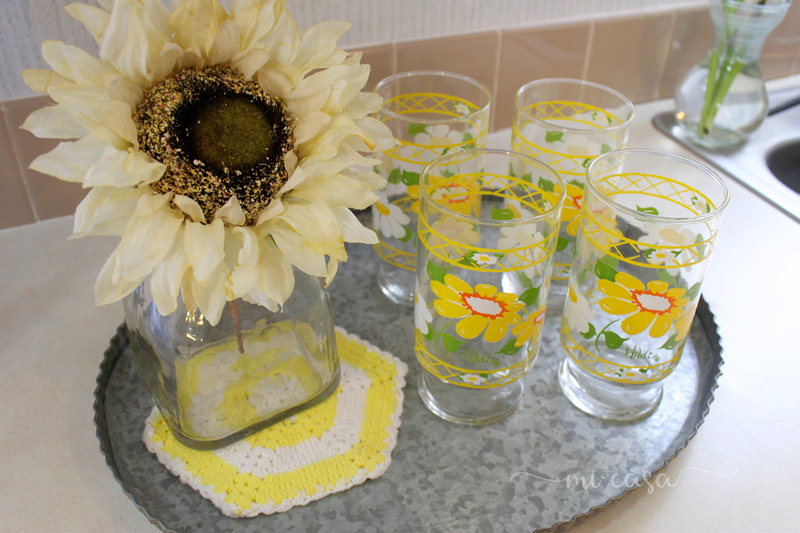 Your curtains are a ray of sunshine and that polka dot, yellow floral plate is gorgeous. 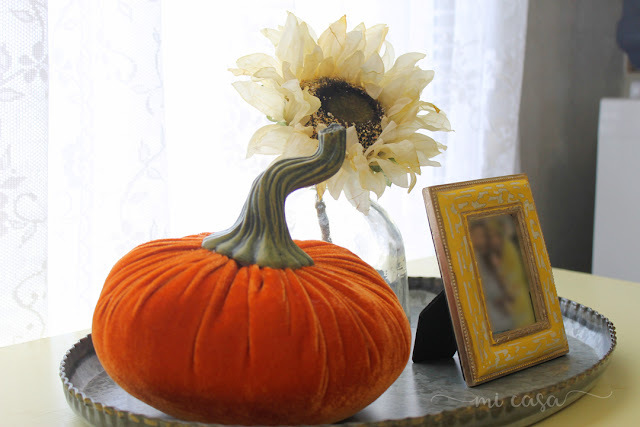 Cute mustard pumpkin, too. Colour my world with bright, happy rainbow-filled colour is what I say. As for being "on trend" with one's home......I never am. =) Such a delight to visit your happy home, sweet Beca. Your house is lovely ! 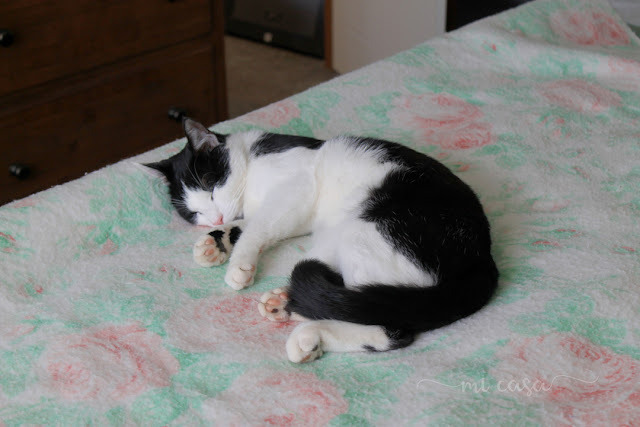 Thanks for stopping by my blog, Nanaland, Beca. I always get excited when I have a new commenter. I totally agree with you about color. All that white was not to my taste at all. I hope it is a trend that has seen its last days!! Plus, keeping it clean!UGH!! I have always been drawn to warm happy colors. I find I enjoy those colors in my cross stitch projects as well. I prefer color in my life and home as well. 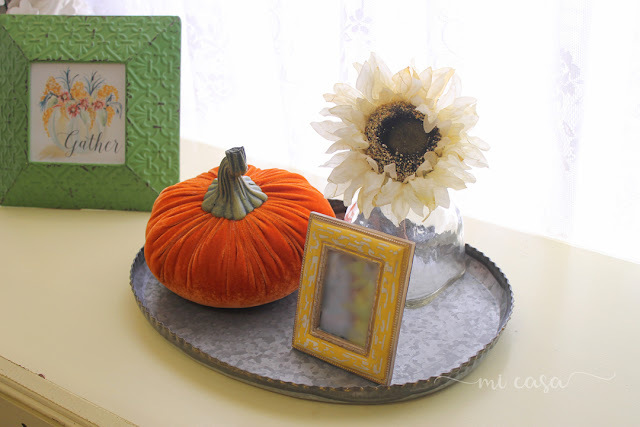 Yellow is a perfect color for fall too. 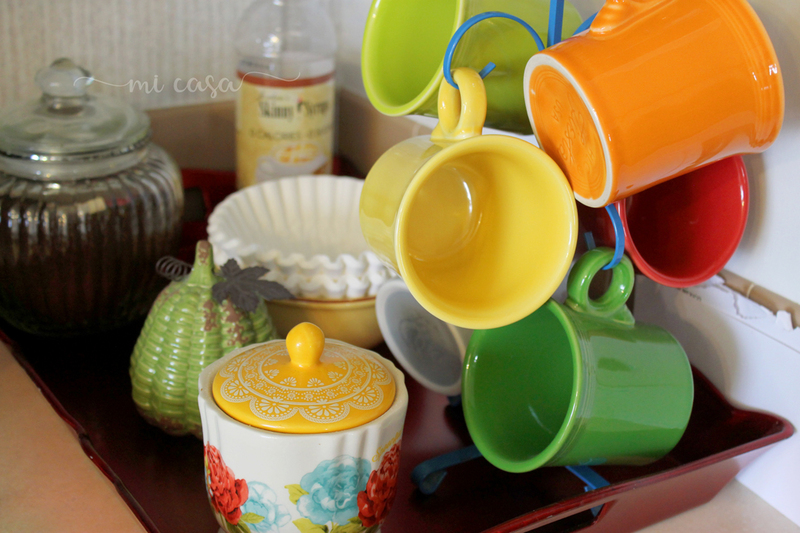 You have some very nice things....thanks for sharing with us, and have a lovely, colorful day! I love color too and yellow is such a cheerful color. Since I painted my kitchen cabinets yellow I absolutely love my kitchen. 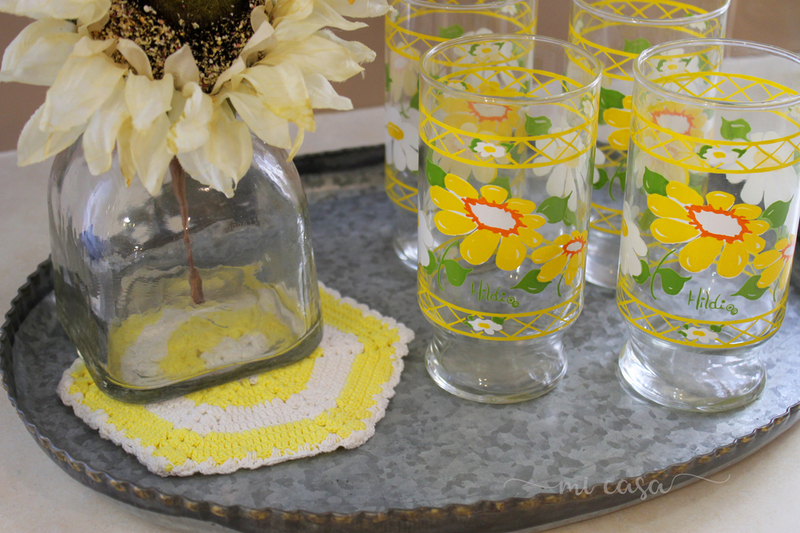 Those vintage glasses are adorable as well as all your other pretty cheery touches around the house. It is always fun visiting and seeing what you're doing. God bless you and have a splendid day. Hi Beca, oh your yellow curtains look so bright and cheery and I like the way in looks in your living room. 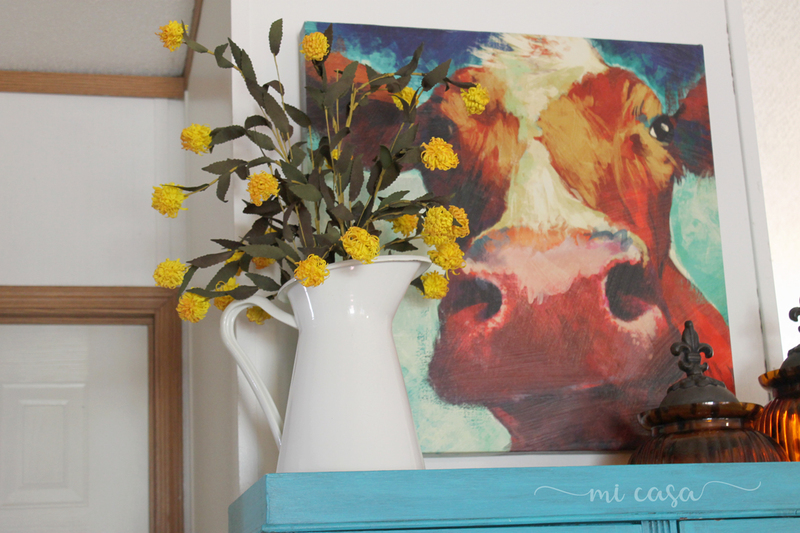 I love yellow and it is on my kitchen walls and in my bedroom! My mom had a yellow handbag that I really like and gave to me and I used in the the spring and this summer and I got compliments on it. Your bag is so cute and I hope you enjoy using it. 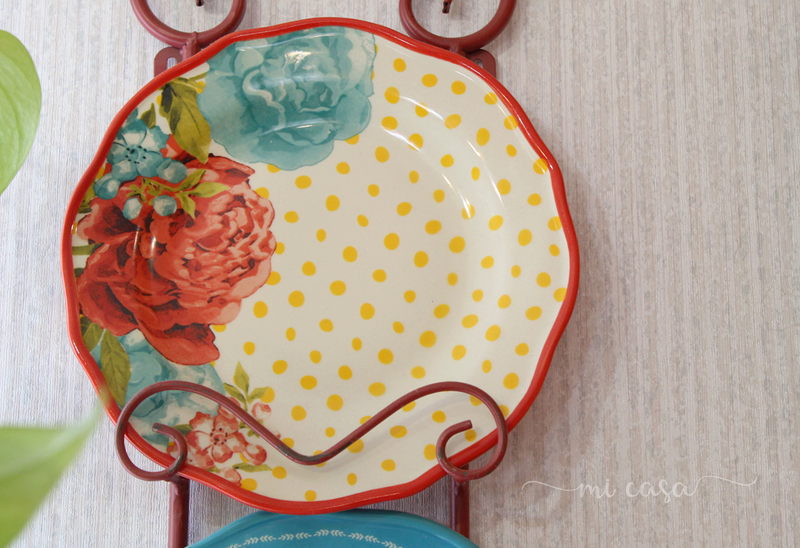 I am like you and need color in my house too. Have a happy fall. You are blessed with a beautiful home, your bright decor is a delight. I love all those yellow touches, a joy to visit. Well, I've been hooked on red for a while now. 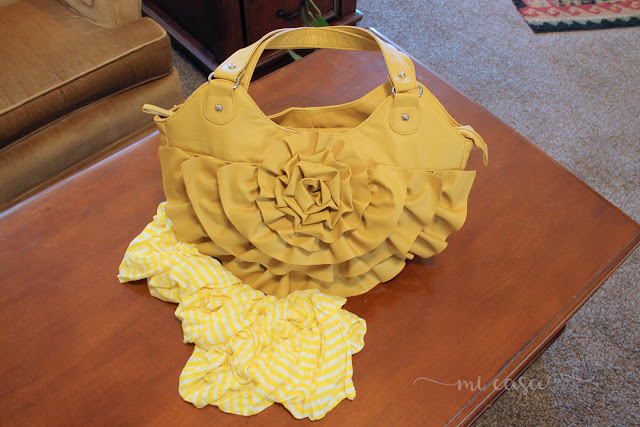 :) The yellow is so pretty in your home, and I love that little yellow bag. Mr. A is beautiful and reminds me so much of our Bickett (or Mr. B as we called him) isn't that funny. I miss Bickett so much. Hi Beca i think yellow is such a happy colour and your yellow curtains look amazing and gee i love your new yellow bag and scarf too. Lovely colorful home! Yellow and purple are my favourite colors :) I never liked gray earlier but now I like a mix of colorful with light gray and white in the background. Aw! Mr. A is very cute! I love color, too. 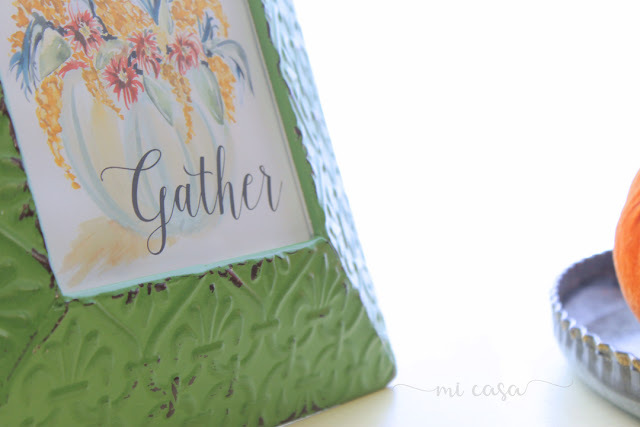 Your home is so cozy and welcoming! I love all the colorful displays you have. Everything is so well put together and pretty! Yellow is such a cheerful, happy colour isn't it. Your yellow touches look so sunny & bright & happy Beca. Just lovely! I could not live in a minimalist home myself ... my son & his wife have a very minimalist grey/white home & when I visit them, my fingers itch to hang things on the wall & add some colour! Your home looks just wonderful!